Click here to find out How the Forrest E. Stokes South Wastewater Treatment Plant got its name. The Henderson Water Utility operates two Wastewater Treatment Plants, designated “North” and “South”. 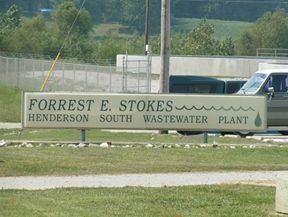 The South WWTP, named after Forrest E. Stokes, is located at 4145 Quinn Landing Road in Robards, KY. 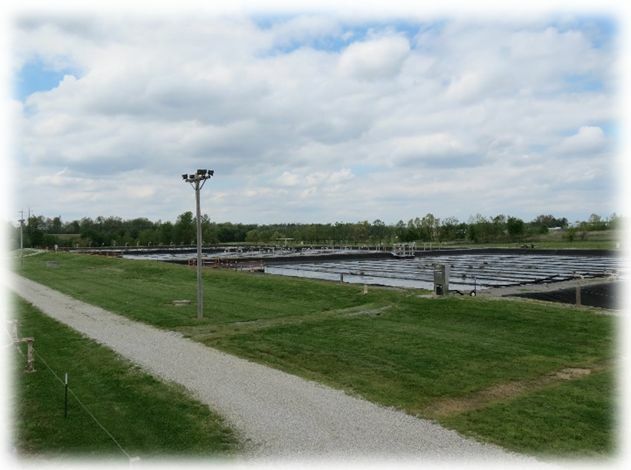 The F. E. Stokes Wastewater Treatment Plant proudly serves residents and industries of southern Henderson County, Sebree and portions of McLean County. The South Wastewater Treatment Plant (SWWTP) was constructed as a secondary treatment facility in 1995 to service Hudson Foods (now Tyson Chicken, Inc.). The plant was expanded in 2003 to handle greater hydraulic capacity and biological loading. Four additional aeration basins, two additional clarifiers, two aerobic digesters and an additional belt filter press were added. The ability to pump 8 MGD was also added. However, effluent force main sizing was not completed and the plant remains a 4 MGD capacity plant. The SWWTP is operated 24 hours-per-day, 365 days-per-year and provides full secondary treatment via an extended aeration variation of the activated sludge process. 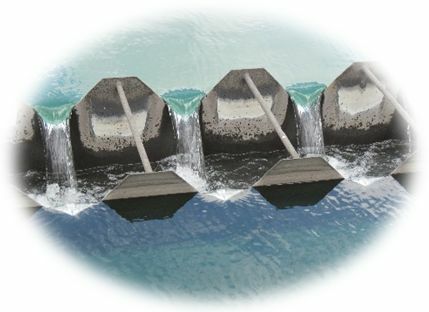 The water enters into the headworks where it is screened and split equally into three aeration basins. Here, it is mixed with air and activated sludge. The detention time in this basin is 18 – 60 hours depending upon influent flow. During this time the aerobic bacteria and microorganisms present in the activated sludge consume by “eating” most of the organic matter. These bacteria and microorganisms, referred to in the industry as “bugs”, depend on oxygen for their respiratory systems the same as humans. For this reason large quantities of air are pumped into the aeration basin where air bubbles rise continually up through the liquid to provide sufficient oxygen for the bugs to breathe. Four (4) groups of bugs do most of the “eating” in the activated sludge process. The first group is bacteria which eat the dissolved organic compounds. The second and third groups of bugs are microorganisms known as free-swimming and stalked ciliates. These larger bugs eat the bacteria and are heavy enough to settle by gravity. The fourth group are microorganisms known as Suctoria & Rotifers which feed on the larger bugs and assist with settling. All the basins are excavated “ponds” that are lined with a heavy gauge geotextile that contains the wastewater within the basin. From the aeration basins, the wastewater, now called mixed liquor, flows to secondary clarifiers to allow the flocculated biomass of solids to settle out of the water. The solids biomass, which is the activated sludge and contains trillions of bacteria and other microorganisms, is used again by returning it to the influent of the aeration basin splitter box for mixing with the raw sewage and ample amounts of air. 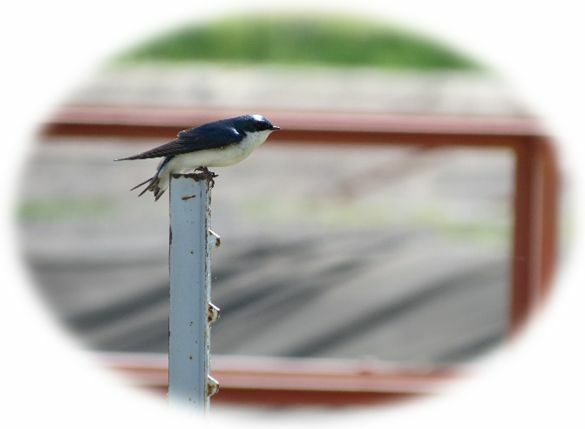 This biomass, which contains many dead “bugs”, acts as food for the live bugs in the extended aeration basins, causing them to reproduce at a high rate, jump-starting the treatment process in the basins. 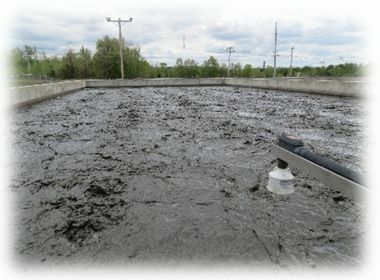 A portion of the sludge in the clarifiers that is not needed to sustain the process is drawn off (wasted) and sent to a digestion and dewatering operation, described below. The final phase of wastewater treatment consists of disinfection with chlorine that kills more than 99% of the remaining bacteria. The disinfected water is then discharged into the cooling water outfall for Big Rivers Electric Company and into the Green River. The waste sludge reference above is sent to holding tanks, where a digestion process occurs. As a result of digestion, the volume of the sludge is reduced and the organic solids, such as sugar, carbohydrates and fats, are broken down into smaller inert organic and inorganic solids. Carbon dioxide, methane and water are the by-products of this organic reduction process. When digestion has been completed, the sludge is withdrawn from the digesters to dewatering devices known as belt filter presses. The digested sludge consists of approximately 97 – 98% water, so it is necessary to remove enough of the water to produce a material which is dry enough to be hauled in trucks. Water is removed from the sludge by use of porous fabric belts which pass around a series of rolls at increasingly higher pressure. For more effective separation of the water and solids, the sludge is first treated with a liquid cationic polymer which chemically causes the water and solids to separate. 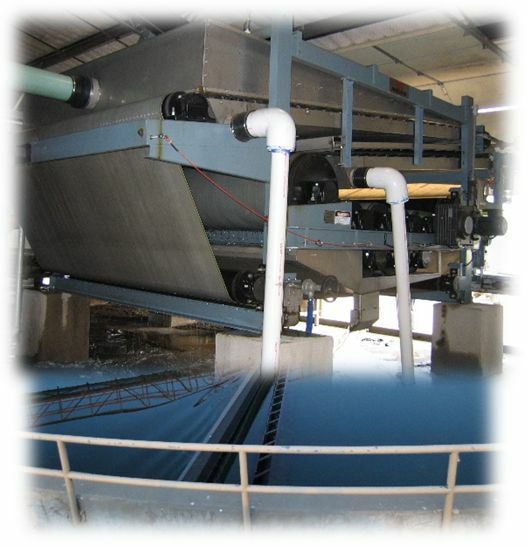 The polymer treated sludge is introduced as slurry between the fabric belts. As the belts wrap around the rolls, a large quantity of water is squeezed out of the sludge and escapes through the porous belts. This water is then returned to the plant for treatment. The process of removing the water is somewhat similar to that used by wringer clothes washing of years past. The dewatered sludge cake at 14 – 18% solids is scraped from the belts on the discharge end of the presses where it drops onto a belt conveyor, is loaded into trucks and is currently taken to a landfill. It is possible that in the future the wastewater sludge will be of such high quality that it will be available for beneficial reuse. Although not an integral part of the actual treatment process, but critical to the success of the process, is the Industrial Pretreatment Program. 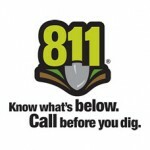 This program is an EPA permit requirement established by the Clean Water Act of 1972, the purpose of which is to guard the quality of the wastewater entering the plant. The program consists of monitoring, surveillance and regulation of the wastewater discharge from major industrial contributors to the municipal wastewater collection (sewers) system. Discharge of certain types of chemicals and metal compounds can have a severe toxic effect on the wastewater treatment process and therefore must be regulated to prevent such discharges. The characteristics of the discharges from some industries are such to require that the industry construct and operate a contaminant loads equalization basin prior to discharge to the municipal wastewater collection system. The operation of the Henderson Wastewater Treatment System contributes to improvement of water quality in the Green River, but also the Ohio River as the Green flows into it. As a result, quality treatment at the SWWTP helps to provide recreation and health benefits for the entire community. The Ohio River is, in certain respects, one of the community’s most valuable assets and the protection of this asset is a primary goal in the operation of the Wastewater Treatment System. The higher water quality also helps, proportionally, to provide a cleaner water source for many cities downstream of Henderson all the way to the Gulf of Mexico.